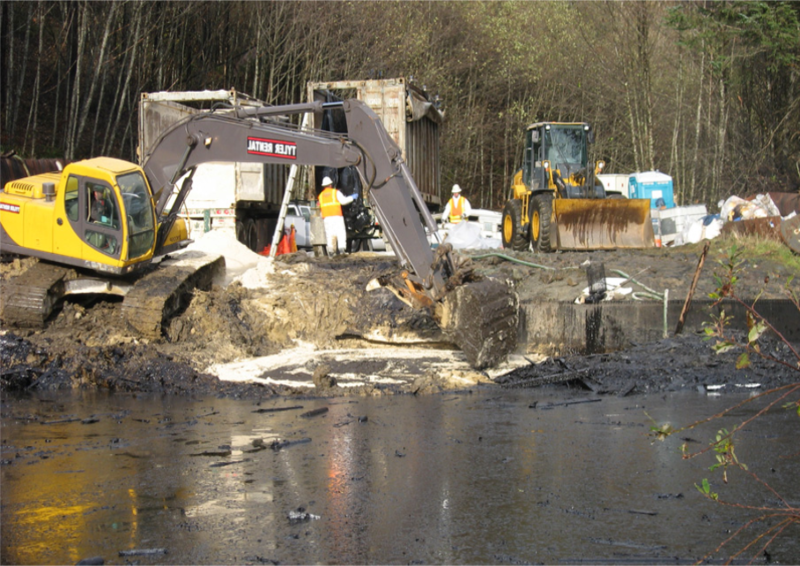 NRC was asked to assist in the time critical clean-up of a property after the Alaska Dept. of Environmental Control (ADEC) determined a 1930’s, bunker fuel tank, abandoned for seven decades, was in disrepair, leaking oil into the Channel and an imminent threat. The tank, overlooking a major port in Juneau, formerly supplied fuel oil to the town and the Alaska-Juneau Mine. Four challenges faced NRC: the lack of any Alaska based TSDF outlets for waste disposal; no existing road or utility infrastructure at the site; the requirement that any non-local resources would need to be imported by air or water; and a 90-day window to beat the onset of an Alaskan winter. A small team was dispatched to develop treatment methodologies. Another team from Seattle worked on aligning barge transport, sourcing materials and equipment, setting up waste approval and mobilizing bins, materials, and specialized tools/equipment. 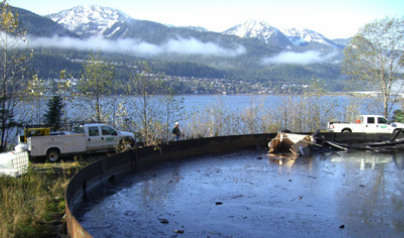 Site clearing and the establishment of facilities was followed by the removal of 16K gallons of petroleum residuals from a bank of small tanks adjacent to the bunker fuel tank. The next task involved the processing of 100,000 gallons of rainwater from within the fuel oil tank. The water layer was pumped through O/W separators, bag filters and carbon. Treated water was then tested, confirmed for acceptance and piped to the local POTW for discharge. The methodology selected for the clean-up of the sludge and debris heel within the tank. was to introduce diatomaceous earth into the sludge while concurrently removing and segregating accumulated debris, including the collapsed roof, vegetation, and wood. Removal operations were conducted using heavy equipment. 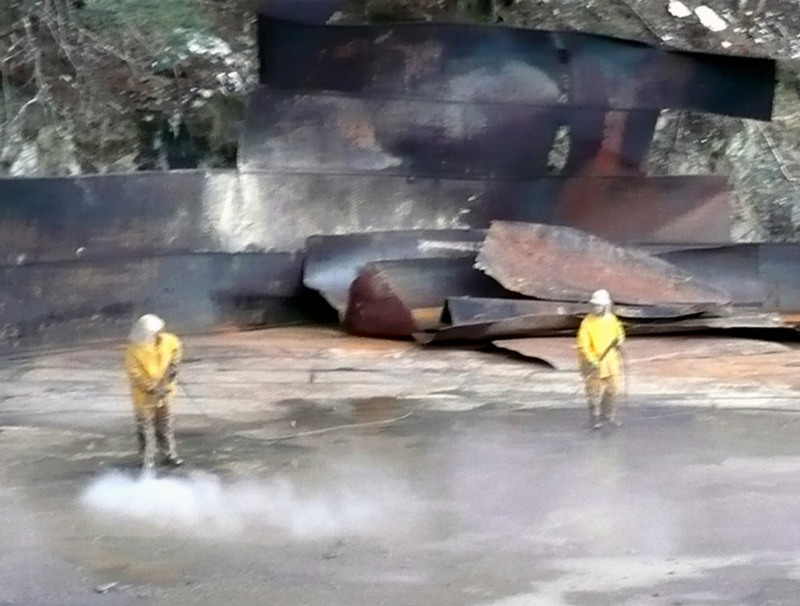 This process continued for three months, processing 1100 tons of solidified sludge and 80 cy of debris, after which the tank surfaces were cleaned and demolished. Regulated wastes were loaded to sea containers, transported to the local port and placed onto barges and ultimately shipped to Washington landfills for disposal. The project was completed under the weekly scrutiny of the ADEC, and the State of Alaska’s Attorney Generals’ Office. NRC was commended on completing the project on time, safely, and in compliance with all the goals originally outlined. Imported portable treatment equipment and other resources via barge. Exported treated wastes to Washington State via the same barge service. On site treatment to condition oil, water and sludge heels into forms acceptable for recycling/disposal. Processing of 1100 tons of solidified sludge and 80 cy of debris.